A rather interesting update seems to have emerged with regard to Ronda Rousey and her WWE schedule after WrestleMania 35. Per WWE's latest ad listings, Rousey is not being advertised for any WWE house shows after the March 17th RAW live event. Additionally, after the post-WrestleMania episode of Monday Night RAW on April 8th, Rousey is not being advertised for any WWE shows. Ronda Rousey officially debuted as a WWE Superstar in early 2018, and has endeared herself to the vast majority of professional wrestling fans and experts ever since. 'The Rowdy One' became the first woman to have held both a UFC as well as a WWE Championship, as she'd previously been the UFC Women's Bantamweight Champion and recently won the WWE RAW Women's Title. As regards her standing in the WWE, there has been a considerable amount of speculation regarding Ronda Rousey potentially bidding adieu to her career as a full-time WWE Superstar after WrestleMania 35 this April. However, Rousey has signed a multi-year deal with the WWE, owing to which the belief is that even though she may take a break from active pro-wrestling competition after WrestleMania 35; she'd probably continue to work for WWE on a part-time schedule. On that note, the WWE's latest ad listings indicate that the March 17th RAW house show at the Resch Center in Green Bay, Wisconsin, is the final house show for which WWE is advertising Rousey. Moreover, Rousey is being advertised for every episode of Monday Night RAW till the RAW after 'Mania (April 8th, 2019). Rousey is also being advertised for this weekend's Fastlane PPV. Nevertheless, after the post-WrestleMania episode of Monday Night RAW (April 8th, 2019), there isn't a single WWE show that Rousey is being advertised for. 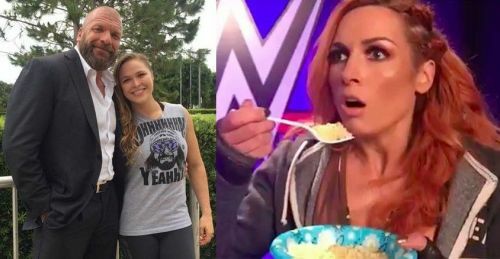 Needless to say, WWE's latest advertisement listings have set the professional wrestling community abuzz regarding Rousey possibly taking a break from her full-time in-ring duties. It's also noteworthy that in a recent interview with ESPNW, Rousey insinuated that she could perhaps step away from WWE in order to have children and start a family. What are your thoughts on Ronda Rousey not being advertised by the WWE for the myriad of shows in the post-WrestleMania season? Sound off in the comments!